Delhi/Gurgaon: Underneath two gigantic chandeliers in the conference room of a posh Gurgaon hotel, 250 elegantly dressed women are ferociously beating drums. Faster, slower, louder, stop. It’s easier than it looks. The women break out into a sweat as they whistle and shout hoi in unison, on cue. The idea of this 45-minute exercise, said Blesson Joseph of team-building company Dfrens, is to demonstrate the power of cooperation. “If you come together, you can make a difference,” he said. GurgaonMoms, the organiser of this day-long event of talks, competitions, pitches and, yes, drumming, aims to do precisely that: Get women to form a network where they help each other. Launched in 2011 by Neela Kaushik, an MBA with a background in digital marketing, as an online support group for mums with queries–what’s a good school, recommend a reasonably-priced dentist, yoga instructor, and even heated discussions on politics–GurgaonMoms now claims 25,000 members, all of them mothers, most of them professionally qualified and some of them in search of opportunities that will put their qualifications to use. There’s Pooja Sardana, an MBA from Indian Institute of Management, Ahmedabad, mother of two children–a girl aged seven and a boy aged four–who put in 14 years in various companies including Unilever and GSK before she quit after the birth of her son in 2014 to “explore a different side of myself”. “I needed the time to figure out what I want to do,” she said. For a while she shared stories on her travel blog and by the end of this year, she plans to launch a brand of children’s shoes. Shagun Singh stayed with her sales job at a five-star hotel in Mumbai even two years after the birth of her son in August 2006. Then her husband got a job in Delhi and, so, she took a transfer. But the Delhi office expected her to clock in twice a day before and after going out on calls. “The work culture did not allow for flexibility and I started exploring options to make better use of my time as a mom and a professional,” she said. Singh’s father ran a business that provided security and housekeeping services. “I realised there is a demand for professional housekeeping services,” she said, “So I launched my own firm, HomeWork.” The job gives her flexi-hours and, more crucially, she’s home by 2.30 pm, which is when her son, now 11, gets home from school. “It’s important for me to be around when he gets back,” she said. Smiti Puri completed her MBA from City University New York and landed a job with a bank in New York. When she got married to a Delhi-based businessman, she moved back to India and took a transfer from the bank. But, she said, the work culture here was “totally unprofessional”. For a while she worked for an internet incubator. Then she got pregnant. “That’s when I decided to help my husband’s family business of textiles, shawls and carpets get online,” she said. But when her second child was born, said Puri, it was like being “hit by a train”. “Nothing I have done, not 20-hour days nor impossible deadlines, has been as physically and emotionally challenging as bringing up my children,” she said. As of now, Puri is happy to be a stay-at-home mom, watching over her two boys aged four and one. She has no plans to get back to a job. The motherhood bump is showing in corporate India. “While there are few entry points for women, the exit gates are many – pregnancy, child care, elderly care, lack of family support, and unsupportive work environment,” said an April 2018 study, Predicament of Returning Mothers, conducted jointly by Ashoka University and the Genpact Centre for Women’s Leadership. “Having a young child in the home depresses mothers’ employment, an inverse relationship that has intensified over time,” found a March 2017 World Bank policy paper, The Motherhood Penalty and Female Employment in Urban India, written by Maitreyi Bordia Das and Ieva Zumbyte. India’s low female workforce participation rate, at 24%, according to the 2018 Economic Survey, is amongst the worst in South Asia. Between 2004 and 2011, the year of the last census, nearly 20 million women fell off the labour map, and there are no signs that this slide has stopped. This dwindling participation by women in employment is perplexing because it comes at a time of increased educational attainment, declining fertility and economic growth. Paradoxically, as our September 2017 story showed, it is India’s most educated women who are leaving jobs faster than others. Our nation-wide investigation (links to other parts in this series at the end of this story) found that women are falling off the labour map for various reasons, including the need to get their family’s permission to work, social attitudes about what is appropriate work for women, bearing a disproportionate burden of unpaid care work, safety issues and the lack of infrastructure such as affordable and reliable public transport. In most cultures around the world, mothers are the primary caregivers of their children. But in India, motherhood has been elevated to an exalted status. “Socially, mothers are expected to put their children’s needs above all others, and certainly above their own,” said Das, author of the 2017 World Bank paper we referred to earlier. A woman who prioritises her career ahead of, or even alongside, young children being brought up by domestic workers or in daycare “often receives implicit or explicit censure both within and outside the house”, she said. When women get pregnant, the barriers they already face at the workplace just making a name for themselves are amplified, said Sairee Chahal, founder and CEO of Sheroes, which describes itself as the world’s largest online career destination for women with two million members. As joint families break down, the burden of child rearing goes up. “Motherhood places a penalty on almost all female workers–unless formal or informal institutions, as well as fathers and husbands, step in to share care responsibilities with women and female wages are high enough to compensate for the monetary and non-monetary costs of childcare,” said Das. “Our own studies have found that having young children constrain women’s employment whereas having an older female relative, say, a mother-in-law, increases her chances of employment,” she said. Globally, mothers of children below the age of five have, at 47.6%, the lowest employment rate compared with 87.9% for fathers and 54.4% for women who had no children, found a June 2018 study of 90 countries by the International Labour Organisation (ILO), Care Work and Care Jobs for the Future of Decent Work. All over the world, it is women who bear a disproportionate burden of not just child care but also other work around the house–cooking, cleaning, looking after the elderly and disabled, fetching firewood, fodder and water. In no country do men and women equally share unpaid care work. It is women who end up doing over three-quarters of the total global amount of unpaid care work. This work, needless to say, is unpaid. Of course, it comes at a cost. Gender inequality in household work is reflected in the labour market. Put simply, the more you work (unpaid) in the house, the less time you have to work (paid) in the market. In 2018, found the ILO report authored by Laura Addati and others, 606 million women of working age all over the world declared themselves to be unavailable for employment due to unpaid care work, while only 41 million men were inactive for the same reason. It is unpaid care work that constitutes the “main barrier to women’s participation in labour markets”, noted the report. Source: International Labour Organisation, Care Work and Care Jobs for the Future of Decent Work, June 2018. Note: ‘Personal’ means education, sickness or disability. ‘Reasons related to labour market’ includes awaiting recall to work, believing no work available and lacking required qualifications. All numbers in percentage. “A high road to care work implies achieving gender equality in labour markets and in households, therefore addressing the motherhood penalty,” said Laura Addati, lead author of the report and maternity protection and work-family specialist, ILO, Geneva. “Since care is a common good, the report calls for the overall and primary responsibility of the State in adopting transformative care policies in five main policy areas: care, macroeconomic, social protection, labour and migration policies,” she said in an email response. Farzana Afridi, an associate professor with the Indian Statistical Institute, agreed: It is marriage, rather than motherhood, that is the first stumbling block in women’s workforce participation. In 2011, for instance, half of all unmarried women in the 15-60 age bracket were in the labour force while the comparative rate for married women was 20%–a figure that has remained more or less stagnant for three decades, she said. “For most women, there is a very narrow window to join the labour force between the time they complete their education and the time they get married,” she said. With motherhood, the chances of remaining in paid employment do go down–but not as much as they do with marriage, said Afridi. 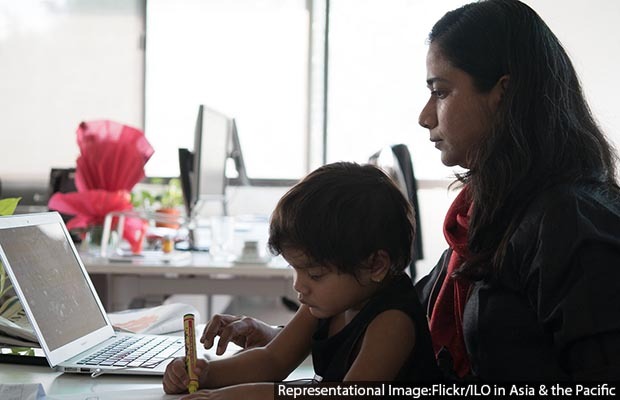 Mandating paid maternity leave is one obvious intervention that governments can make, even though in India it impacts only the roughly 5% of women who work in the organised sector. Yet, found a recent study by human resources services company TeamLease, in the short-term, enhanced maternity leave could lead to as many as 12 million women potentially losing jobs across all sectors in 2018 as a result of the Maternity Benefit (Amendment) Act of March 2017 that increased maternity leave from 12 to 26 weeks. The job loss would typically take place in small and medium-sized enterprises and is “likely to vary from reduced demand for women to unethical behavior of reducing the upfront salary for women”, said the report. However, “large, professionally managed companies–both private and public sector–and medium-sized public sector companies will actively back the amendment and are more likely to hire more women”, it said. Among some companies, there is a recognition that they will have to lean out if they want to retain female talent and pursue employee diversity as a goal. Diversity is not a warm, fuzzy idea for corporates but makes sound business sense with a more heterogeneous group likely to throw up better innovation, said Roopa Wilson, who manages diversity and inclusion at IBM India. IBM has several programmes designed specifically for returning mothers–from providing an additional six-months’ unpaid leave post the mandatory six-month maternity leave to providing online learning courses and trainings so that employees, particularly women on long leave, don’t become redundant, said Wilson. In addition, she said, the company provides for childcare centres in almost all locations across India and even has an elder care programme designed for the parents and parents-in-law of employees (picking up medical reports, sending a nurse for shots etc). Despite these steps, said Wilson, last year the company realised it had not fully factored in women themselves and their desires. Up to 51% of all entry-level jobs are filled by women, and these women only start hitting roadblocks after the first three to four years of their jobs, found a 2011 Nasscom survey. That’s when they might get married and have to relocate to where their husbands live and work. When they have children, there is a “social and cultural issue where priorities change”, and this is the challenge that workplaces have to address, said Wilson. But, warned Sairee Chahal, workplaces are becoming leaner and there has, in the past few years, been a lot of “change and churn”. “Our economy is not creating enough jobs. We are creating 1.5 million corporate jobs a year, whereas we need a million jobs every month,” she said. In this straitened situation, “one person out is one person less” and women who choose to opt out of jobs are not going to be anyone’s priority. Reams have been written ever since Facebook chief operating officer Sheryl Sandberg advised professional women to “lean in” and stick it out. It’s important to stay the course, agreed Paroma Roy Chowdury, vice president, public affairs, Softbank, and mother to a 26-year-old son. “It can get really tough and the greatest attribute a woman at work can have is a thick skin,” she said. Chowdhury made the switch from journalism to corporate communications, taking three months off when she had her son, and then diving right back to work. What moms want at work, she said, is a certain degree of empathy, when a kid falls ill, for instance. Having more role models and women in mentorship roles would also help. And, of course, she added, there is no over-estimating the value of good support structures at home and at work. But dads are changing too, and it’s important to recognise this, said Aparna Samuel Balasundaram, an author and psychotherapist who has conducted corporate training sessions with companies such as Wipro and Accenture. Balasundaram said she recently held a parenting workshop that was attended by three times as many men as there were women. But ultimately there is no getting around the cultural mindset change needed to get more mothers back into the workplace. But, “for many women the challenge is not external but internal. They are hitting up against their own guilt all the time. It comes from your own judgment, the judgment of your family, and that of your peers,” said Kachina Chawla, a public health specialist whose portal, GharKamai, connecting women professionals with project-based work recently got acquired by Sheroes. This is the twelfth part in an ongoing nation-wide IndiaSpend investigation into India’s declining female labour force participation.